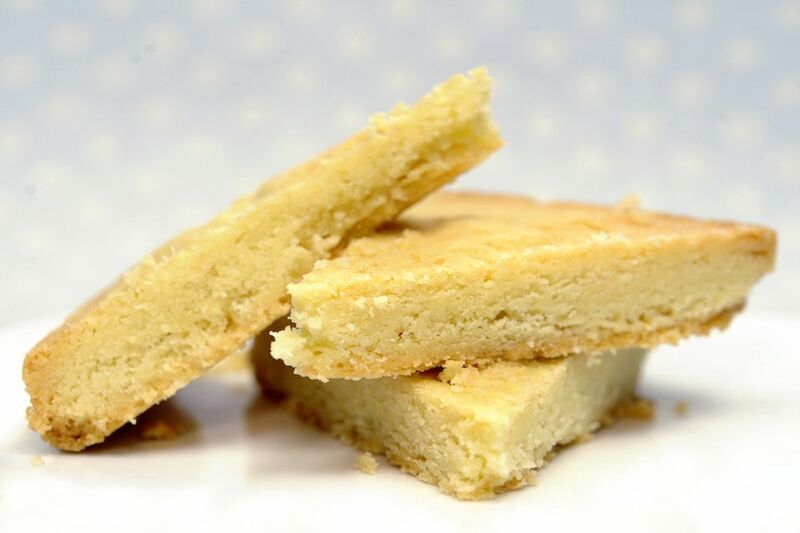 Scottish shortbread is a quintessential part of Christmas in Britain, however, why should this lovely buttery confection be kept for once a year? The short, buttery tails (as they are fondly known) are a recipe which ordinarily should never be messed with, but with a little lavender flavour, this turns them into an extra special treat perfect for a summer's day picnic or party. Using lavender in food can be tricky as the flower has such a dominant flavour and a little goes a long, long way. Also, the flowers when used in biscuits as fine as these can also burn quickly, so to solve both problems in one go, use a culinary lavender essence. The essence can be found easily in a grocers or supermarket or buy online. If you do have fresh culinary lavender flowers, then feel free to use them as decoration or add the lightest of sprinkles into the mixture before baking, simply for colour. To make shortbread tails you will need a 23cm (9") round tin, a fluted tin gives the shortbread a lovely crimped edge but don't feel you have to use one. Grease with a little of the butter from the recipe. Heat the oven to 160C/325F/Gas Mark 3. In a large baking bowl, place the butter, the sugar, salt and the lavender drops. Beat thoroughly using an electric whisk until the mixture is soft, light and creamy. Add the lemon rind and give the mixture and quick mix. Sieve in the flour, followed by the cornflour (starch), stir through until completely incorporated. Press the biscuit mixture into the tin making sure it is into the edges and even on the top. Sprinkle with a little caster sugar and bake for 30 - 35 minutes until the shortbread is light, golden brown. Remove the cake from the oven and place onto a cooling tray. Using a sharp knife, mark the shortbread into 12 wedges and leave to cool completely in the tin. Once completely cold, carefully remove the wedges from the tin and store in an airtight tin. The shortbread keeps well for several days. Serve alongside fresh summer fruits, and whipped cream, a trifle, or put your feet up and enjoy with a nice cup of tea. **You can adjust the number of drops to your taste but always add with caution, lavender can be very strong.